As I type this, I keep running my tongue around my teeth feeling how clean they feel. It's that 'just-been-to-the-dental-hygienist' clean feeling - which ordinarily only lasts about a day. But for several days now I've been enjoying that feeling. And I haven't been to the dental hygienist for ages. So how have I managed to get these super-clean teeth? 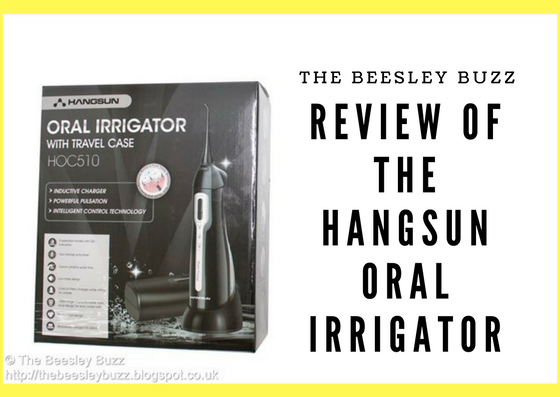 I've been trying out the Hangsun Oral Irrigator - it is a brilliant water flosser product that comes with 2 'heads' and a travel case too. I needed to charge it for 24 hours before first use (although a quicker top-up charge is sufficient for subsequent uses), then it is a case of simply filling the water chamber, and setting which mode you prefer (normal, soft, or pulse) and away you go. My very first use of this was a little bit disastrous as I'd never used a water flosser before. My only experience of one was at the hygienist where they take control and do the flossing. Without reading the instructions I aimed the flosser at my teeth and turned it on. Water sprayed all over my face and bathroom. Lesson learnt. Always read the instructions! After reading the instructions I tried again. You need to place the head of the flosser into your mouth and only leave your mouth slightly open to allow the water to dribble out whilst leaning over the sink. It doesn't look glamorous but it definitely works better than my first attempt which ended up spraying my whole face rather than my teeth and gums. The water tank is easy to fill and empty and it gives around 35 seconds of use. That doesn't sound long and isn't very long as it does seem to empty quickly when in use. But it is long enough to get the job done. I tried using cold water and if you have sensitive teeth like me that doesn't feel as good as using slightly warm water (and it certainly must be NO hotter than 40C). I just had to remember to empty any remaining water afterwards and pop it back onto its charging cradle. 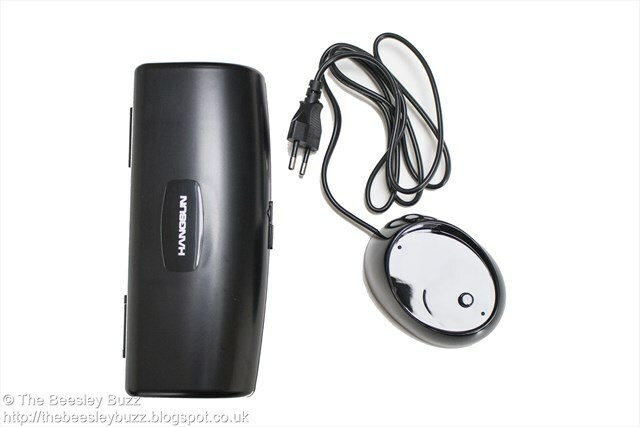 The charging cradle uses a two-pin plug (great for holidays in countries where this is the norm) but in the UK remember to plug it into an adaptor plug or use a shaver-style two-pin socket for it. 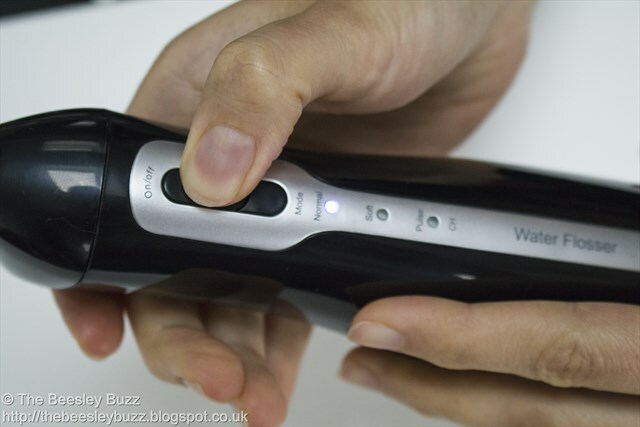 We have one already as our electric toothbrushes use the two-pin plug format so it wasn't a problem at all. The travel case holds two flossing heads (they clip in either side) and it fits the main unit in it. The charging cradle will need to be taken separately when travelling. The water flossing unit itself is cordless but relies on the charging cradle which plugs in to the mains supply to recharge. As someone who regularly feels the need to floss my teeth using regular floss - this product has taken flossing to another level! I find regular flossing with dental floss sometimes leaves bits behind. Whereas this product flushes everything through with the water leaving my mouth feeling fresh and clean. In fact, I don't think my teeth have ever felt so clean. This brings the water flosser down to only £23.99 based on the current price of ￡29.99 and it's available to buy on Amazon here. Disclosure: We were sent the Hangsun Oral Irrigator for the purpose of review. All opinions are our own. All information correct to the best of our knowledge at the time of publishing. 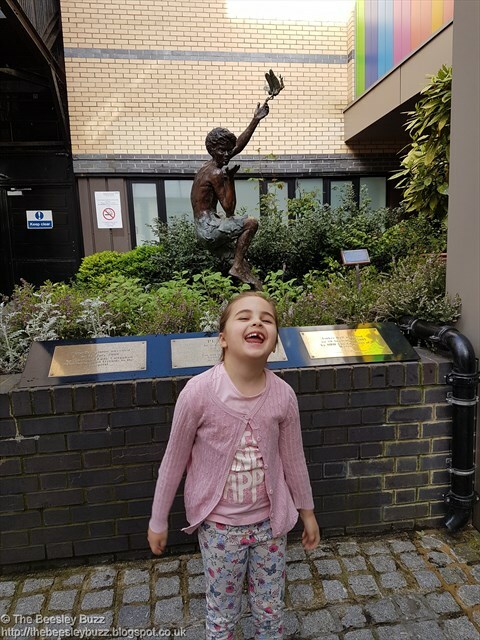 Miss T at Great Ormond Street Hospital for her intensive physiotherapy rehab. 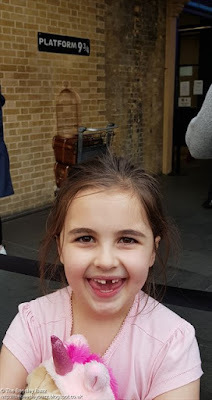 Miss T has Juvenile Idiopathic Arthritis (JIA) – a painful debilitating auto-immune condition. At present, there is no cure. Treatment involves drugs (such as Methotrexate) that reduce the immune system to try to slow it from attacking its own joints, medication to reduce the side-effects of other medication, regular blood tests to monitor side effects, supplements to boost depleted levels of vitamins (such as Vitamin D) and a range of therapies (physiotherapy, hydrotherapy, exercise to build core strength, and classes to build confidence). 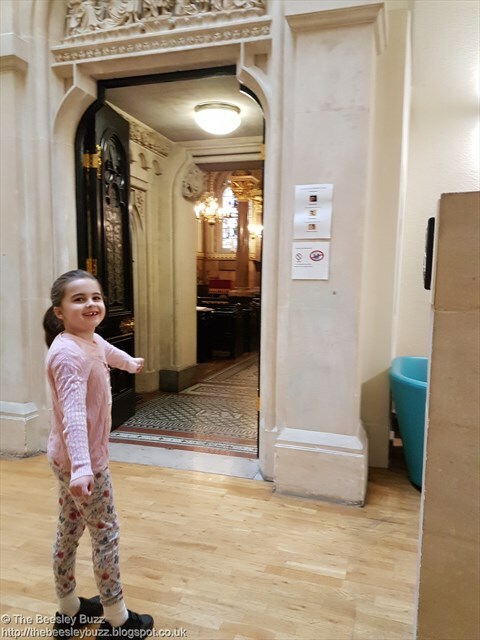 In April 2018 Miss T attended a two week physiotherapy course at Great Ormond Street Hospital (GOSH). This post is for anyone approaching a similar stay at GOSH to help you know what to expect and a few tips we picked up (some fab tip from others- thank you, you know who you are - and some we identified ourselves) that may make things easier. GOSH have a fantastic facility in Weston House – just over the road from the hospital itself. Once your place on the physio rehab is confirmed you will usually be offered a space in the hotel. Be aware that there is no guarantee you will be in Weston House – sometimes you will be placed in a local private hotel if Weston is full (as it is used for accommodation for a whole range of services, not just physio rehab). If you live fairly locally, you may prefer to commute in – but be aware of the start times for sessions so you don’t miss anything. The accommodation is fairly basic, but clean and a hugely welcome facility that is provided – it is free for one parent and the child to stay, so saves a fortune in commuting train fares or private hotel bills. Our room was typical, with three single beds (some have two), some cupboards, desk, TV and ensuite bathroom. It is cleaned each day by the housekeeping team, with fresh towels as needed. The door key is a credit-card sized electronic pass card in a badge holder. Bring a lanyard with you if you have one, to carry the key around. This was suggested to us, and I was glad to bring it – it saves forgetting the key when going backwards and forwards to the kitchen. Bring a towel or two. Some are provided, but they are quite small, so if you plan on having a shower during your time here, bring a decent sized towel! The beds are ok, but the mattress, duvet and pillow are wipe-clean plastic – very hot in warmer weather, so be prepared to dress light at bedtime. Apparently the rooms can get chilly in colder weather, so bring layers if here in the winter. Some people have found the pillows very thin so if you need a plump pillow, it may be best to bring your own. Bring a tea-towel, too. The kitchen has paper towels, but they are not great when you dry up. The kitchen is well equipped, but don’t expect to be competing with Jamie Oliver whilst you are here. Whilst the basics are here, a few things you might want may be missing (slotted spoon / colander / sieve, for example). Make and bring a ‘do not disturb’ sign for your door. It didn’t happen to us, but one or two of the housekeeping team have apparently been a bit over-enthusiastic when arriving to clean rooms! While we were here, we paid a £10 returnable deposit for our room key, and another £10 deposit (also returnable) for a TV remote control… not that we watched TV much. Our first remote control didn’t work, so we swapped it for a second. For week one, you will usually arrive on the Sunday (and go home Friday). For week two, it is Monday to Friday. Before you arrive you will be sent a pack of information. Top tip – read it all before you come! I know it is quite long, but it is useful to see in advance. Make sure you have a list (even if only in your head) of all the health professionals your child is in contact with, contact details of your child’s school, and details of any current or recent problems relating to the JIA. On the first Monday morning, you will spend time on the ward for clinical assessment (height, weight, blood pressure, swabs for infection and so on) followed by an assessment by the physio team. There is some waiting around, so bring something for your child to do. Bring an envelope or plastic wallet for all the paperwork you get given! If you have any questions about what is happening, where to go, or who to speak to, this is your first (and possibly best) chance to do it. The physiotherapy is tiring. It’s hard work. But with the support and encouragement of each other and the physio team they keep going. They get stronger. They notice improvements. And, although exhausted, tired and emotional, they come out happier and more confident than when they go in. The class is mixed, with children experiencing a range of different health conditions. Some are more mobile than others, and there is a good mix of ages. As the course is usually two weeks’ long, they overlap so there are ‘experienced’ kids alongside the newbies. All of this helps develop a nurturing environment where they all help each other out. You will drop your child off to be taken to the physio gym and at the end of the session, they make sure the kids are taken to the hospital school where you will pick them up at the end of their morning school session. Hospital school starts on Tuesday morning, but we completed the paperwork and took it straight down so Miss T could meet her teacher. The school was assessed as Outstanding by Ofsted, and the kids there were clearly enjoying their time in the classroom. The school follows national curriculum syllabus, with different subjects through the week and regular visitors to supplement the excellent regular team. 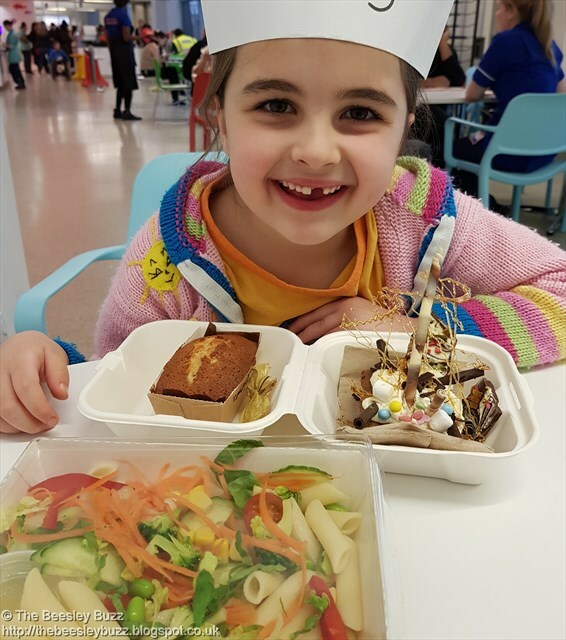 Miss T met a chef on her first session and enjoyed cooking pasta salad, cake and brownies (which were decorated to an amazingly high standard with cream, chocolate straws and spun sugar!) 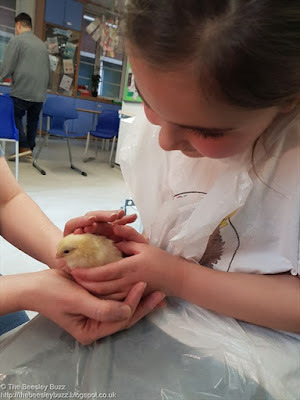 Later in week one Miss T watched over eggs and saw them hatch, cuddled day-old-chicks, learnt computer coding, was filmed for hospital TV (and an ITV documentary), met the hospital support dogs, painted, drew and wrote, and overall had a fantastic fun-filled time. Week two was equally full-on, with different visitors and activities, and just as much fun. Miss T with her culinary creations. Miss T was able to cuddle a day-old chick after watching it hatch at the hospital school the day before. There are a load of sessions throughout the two weeks – pain management classes, meet-the-physio, briefings, assessments – and it is important you go to all of them. It does take time, but they are all valuable. Between sessions parents do get quite a few breaks – time to catch-up with other parents, and perhaps hit the Lagoon coffee shop, or get on with work if you have brought it with you. Make sure you bring something for you to do, as well as for your child, to keep you all busy during the down-times. We (as parents) had teaching sessions from an Occupational Therapist, Physiotherapist and Psychologist, all of which were really helpful. The kids have similar teaching before one of their physio gym sessions, and Miss T was able to tell me all about the different types of pain and how to manage her chronic pain. Those tips have really helped her since returning home, and she has been teaching the rest of the family about ‘square breathing’ and her ‘happy place’ where pain cannot affect her so much. At the end of the afternoon, you are expected to do "functional excercise" - a very real and important part of the rehab to ensure joints don't stiffen up at the end of the day and to build strength, stamina and confidence for your child. There is load to do locally, so no excuses! In the local area we loved visiting parks, museums, restaurants and so on. Miss T looked completely exhausted on day one, but loved going to Coram’s Fields with a new-found friend and spent a long time exploring and having fun. Needless to say she really was exhausted by the time we got back to the hotel! But the physios do drum-in to the kids how important it is to keep moving. Coram’s Fields (just behind the hospital), which has play areas and animals to see. The beautiful GOSH Chapel (on the ground floor, behind the main reception) is well worth a visit as a peaceful, quiet space. 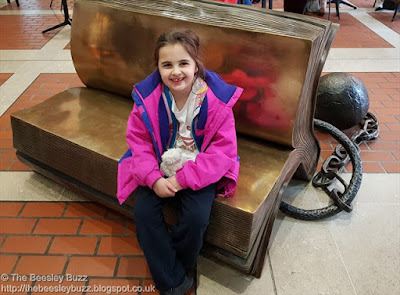 The British Library's iconic book bench. Platform 9 3/4 at Kings Cross station. Visiting the Chapel at Great Ormond Street. As well as the physios, a number of other health professionals are available at GOSH and may meet with your child at some point if need be. They make the arrangements, be it with podiatry, the rheumy team or occupational therapy, and can refer your child on for further assessments that may be needed. There is a diary to complete each day to give feedback to the team on what went well and what was difficult. This helps you and your child keep in touch with the team. And when you go home… lots more homework! You will be given an exercise programme to complete at home. This is also really important as it helps to keep building muscles up over time. When she was first assessed, Miss T scored a leg-strength score of 14 out of 30. By the end of week two, she was assessed as 27 out of 30. The improvement was huge. Her confidence also grew hugely, both in the gym and out and about. She still has ankle pain – and we are currently waiting for another MRI to see what is happening with that ‘mystery foot’, but is doing her exercises every day before school. It’s amazing to see her doing 30 repetitions of 3 different exercises on each leg, with a 1kg weight attached, every morning, with a huge grin on her face. A couple of weeks ago, she couldn’t have done it. So the physio rehab really helped her. 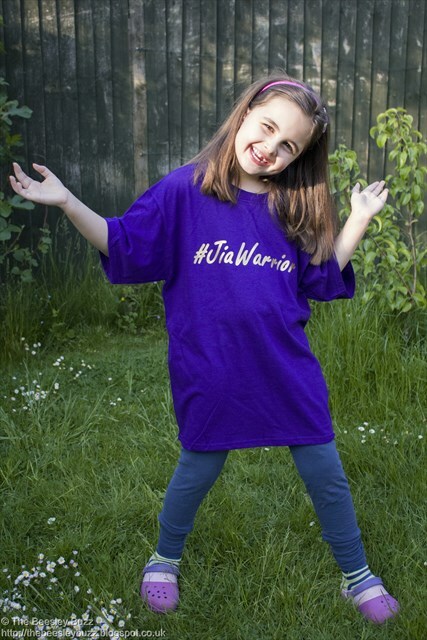 As a reward for all her hard work, we've ordered her a #JiaWarrior t-shirt from the Juvenile Arthritis Research shop. Can't wait for it to arrive - she's grown in confidence in being able to talk about her arthritis more and so hopefully this t-shirt will help her raise awareness about children like her who have to go through so much in the fight against arthritis.